Colombian President Juan Manuel Santos met Tuesday with Japan's Prime Minister Shinzo Abe, calling for accelerated bilateral trade talks and more investment by the Asian economic powerhouse. 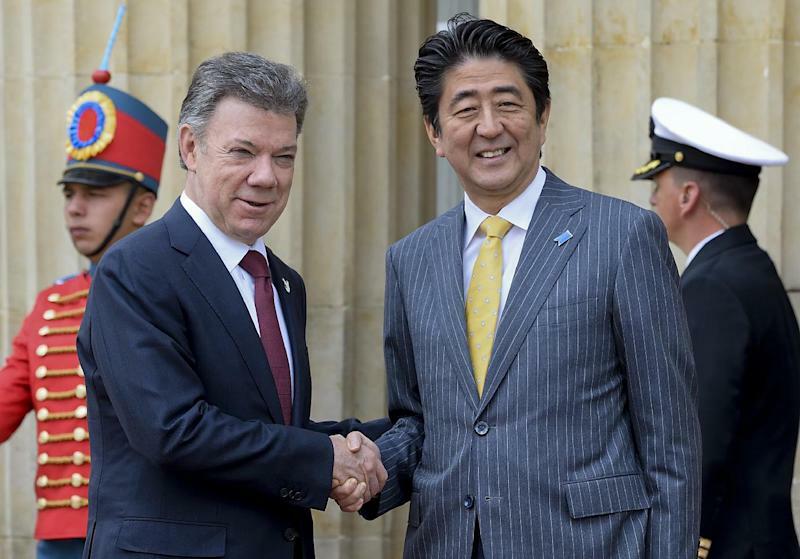 Speaking after a meeting at the presidential palace, Santos noted that Japan was the biggest Asian investor in Colombia. "We are looking at the possibility of increasing these investments in many areas," Santos said. "This is why we have an agreement on protection of investments," he added, noting the legislation had already passed through Colombia's parliament. Santos also emphasized his country's desire to secure a bilateral trade agreement, an issue which has already been the subject of six rounds of talks. "We have instructed our delegations to accelerate these negotiations, to give our products better access to the Japanese market," Santos said. Imports from Japan were valued at $1.5 billion in 2013, compared to exports towards Asia totalling $390 million according to official figures. The first Japanese leader to visit Colombia, Abe said he hoped his visit would boost bilateral relations and co-operation on "global issues." Abe has already visited Mexico and Trinidad and Tobago during his tour of the region. He is due to visit Chile on Wednesday before heading to Brazil on Thursday.